Mom, the Intern: On my Christmas list. I try not to be too demanding about stuff, but I really, really, really want this dining set. 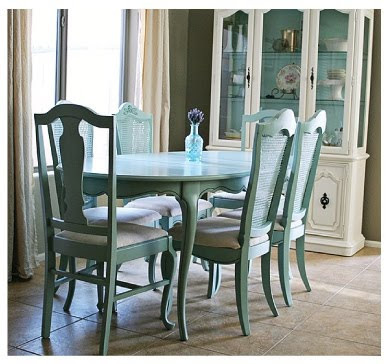 I am obsessed with all things antique aqua. By the way, today is my Bubby's 3rd birthday. Can you believe it? I threw her and her little-bitty friends a super-fun pink cupcake party on Friday and I have loads of pictures to show you. But, the Smush is crying (as always happens when I am about to sit down and blog) so off I go. Put in a good word with the Man in the Red Suit, mmkay? Happy 3rd B-Day Bubby! Can't wait to see the pics, I'm sure she was as adorable as ever! I love that table! I think you could find a groovy old table to paint. Get on it sister! Hi- I read your post on CJane's blog and really liked what you had to say. I know you and I haven't seen eye to eye in the past, but I respect what you had to say! And yes, that dining set is fabulous! It always seems like whenever I get around to taking a nap, Jack decides to start fussing. By the way, the dining set is gorgeous!